Golan Duncan, R., El-Moslimany, H., McDonnell, J. & Lichtenwalner, S. (2011). Supporting Teachers’ Use of a Project-Based Learning Environment in Ocean Science: Web-Based Educative Curriculum Materials. 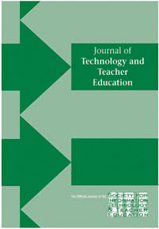 Journal of Technology and Teacher Education, 19 (4), 449-472. Waynesville, NC USA: Society for Information Technology & Teacher Education. Retrieved April 20, 2019 from https://www.learntechlib.org/primary/p/33233/.